Before we learn about unicast routing protocol first let us understand what is unicast. There are types of routing protocol name as intradomain and interdomain. Distance vector and link state is an intradomain routing protocol while path vector is inter-domain routing protocol here this article are described to this three protocol in details. Distance vector is one of the simplest routing protocol which routing decision on the number of hops between source and destination. A route with less number of hops which is considered as the best route. Every router advertises its set best routers. The least cost route between any two nodes is the route with a total minimum distance. Each node maintains a vector of minimum distance to every node. Ultimately all routers build up their network topology based on the advertisement of their peer routers, for example, routing information protocol. Link state routing protocol is the second family routing protocol. It is a slightly complicated protocol than distance vector. 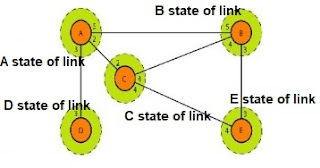 Link state routing uses link state routers to exchange message that allows each router to learn the entire network topology. All router then calculate their best path for routing purposes. Based on this learned topology, each router is then able to compute its routing table by using the shortest path computation. The figure shows that a simple five nodes. Each node uses the same topology to create a routing table bit the routing table for each and every node is unique because the calculations are based on different interpretations of the topology. While each and every person may have the same map each needs to take a different route to reach her specific destination. Distance vector and link state routing both are intradomain routing protocols. These two protocols are not suitable for interdomain routing protocol mostly because of their scalability. Both of this routing protocol became intractable when the domain of operation becomes large. Distance vector routing is subject to instability if there are more than a few hops in the domain of operation. While in path vector routing we assume that there is one node in each autonomous system that acts on behalf of the entire autonomous system.